I heard Ensemble Les Surprises and Yves Rechsteiner perform music from this recording during the 2017 Ambronay Festival (review here), noting that is was the first time the group had played without using a full-sized French Classical church organ, relying instead on a small chamber organ. That is more than made up for by this recording, which uses the important 1783 François-Henri Clicquot organ in the historic priory church of Saint-Pierre-et-Saint-Paul, Souvigny (Allier). The premise of this recording is the programme of the Concert Spirituel given on 8 December 1768 in Paris. It refers to a ‘Suite of symphonies by Rameau executed with full orchestra on the organ by Balbastre’. It seems that Balbastre (the leading organist in pre-Revolutionary Paris) had reconstructed an organ concerto from existing works by Rameau, having already played many solo organ transcriptions from Rameau’s opera for the Concerts Spirituel. Despite being a keen organist, Jean-Philippe Rameau left no organ music. Yves Rechsteiner has already published and recorded his own arrangements of some of Rameau’s operatic and instrumental works for organ solo. 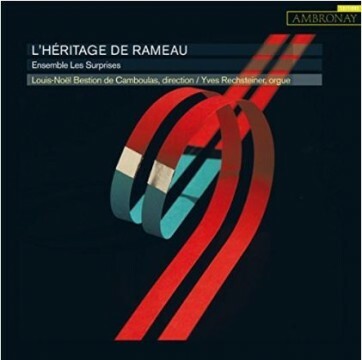 For this recording, he has reconstructed three organ concertos from Rameau’s works as they might have been performed by Balbastre (a pupil of Rameau) in the 1768 Concert Spiritual. In the three reconstructed Rameau concertos, we hear extracts from Les Indes galantes, Les Sauvages, Les Enfers, Dardanus, Hippolyte et Aricie, and Zoroastre. Also included are two Suites de Symphonies, arranged from the operas of François Rebel and François Francoeur, both friends of Rameau. For Rameau’s 1764 funeral, they inserted extracts from Rameau’s operas into their arrangement of Jean Gilles’s Requiem. Although not of the musical quality of Rameau, there are of interest for the rather Italian-influenced style. The Sarabande of the first Suite is played as a harpsichord solo by Louis-Noël Bestion de Camboulas. In the first movement Prélude et Rondeau, as in a number of the other pieces on the recording, there is some impressively eloquent solo violin playing from Alice Julien-Laferrière.